5 runs in the 8th inning will do wonders, especially if you’re only down by 3. MY hometown Rainiers put the kibosh on a homestand sweep by the Las Vegas 51’s with a 5-3 victory last night, even after being levied with THE WORST call at third base I’ve ever seen. Blue was unimpressed with my offer of letting him view the call again on my camera. He was even more unimpressed with my questioning, not one batter later, if the ball that flew over the pressbox directly behind home plate was foul or fair. Having first row seats directly behind third base has its privileges. One privilege was getting in with a pal who scored the tix from his employers season ticket lottery. A second privilege was getting a free parking pass. 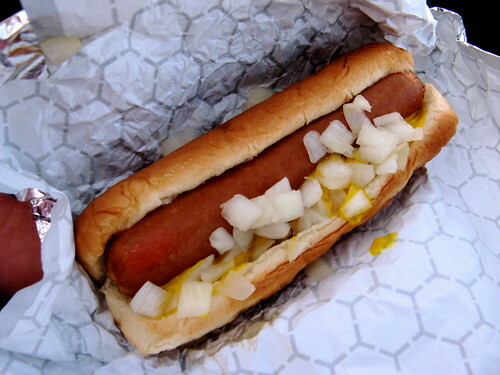 Third was the magic slip of paper giving the bearer a free Rainier Dog, chips, and a drink. Looks very ‘blah’. Kind of limp, and overly soggy…but everything tastes better at the ballpark. Since ballpark dining is always good, this is one of the few places in Tacoma (not for long) where YOU KNOW your dog will be tasty. This hand-held delight tasted like magic in the 5th inning, getting rid of the sour taste of what was shaping up to be a losing game. Onions and mustard are the only things I require. Bliss I tell ya, bliss (especially washed down with watery $1 beers from right field!). p.s. – Not to be a weisenheimer, I gave the abused Blue the ‘good game’ as we left the park, and he gave a smile and a thumbs-up. Minor League Baseball, how I love thee.